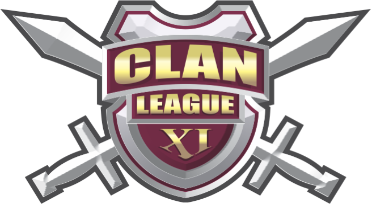 Welcome everyone to Clan League 11, division A; the most exciting division of Clan League. This schedule can also be found in the official sheet. A quick note on these dates: There will always be a minimum of 12 days before the start of a tournament. If a tournament gets created earlier, the start day will remain the same as specified on the schedule above. In the event of a tournament being created too late, the start date will be moved so that there is still 12 days to join. Another quick note, or rather a warning: Before joining a tournament, every player should verify that it is created by me, TBest or another trusted person from Clan League. They should also check if the settings are correct. A mail has been sent to all clan representatives that certain individuals may create fake tournaments to sabotage this season. We can't prevent this from happening, so please double-check before you join a tournament. The full set of rules can be found on the official sheet. In the event of a substitution, the on-going games for the retired player will not be remade. Only games which have not been created will be allotted to the substitute. Both players will use up a slot playing this tournament. A substitution can be carried out by the CL staff. We will guarantee the substitution within a maximum of 3 days. Any new games created within this 3 day period for the retired player may be forfeit as well. Any substitution requests should be made only by clan leaders on the designated forum thread. It is also recommenced to send a PM to Main Administrator and/or Division Organizer referring to the forum post. Communication on the forum serves as notification for everyone. If no one has responded to a substitution request in 3 days, please reach out to the CL panel. The forum post must state. 1. Player subbed out. 2 Player subbed in. 3 Tournament in which the substitution is done. 4. (optional, but recommended ) Number of subs the clan has left. All substitutes will be listed on the doc and games with the sub will be created right away. The subbed in player should aim for a minimum pace similar to that of the tournament (2 games ongoing at one time). All players are excepted to make reasonable efforts to make this work. Substitutions and sub game creation can officially be done either by the tournament creator or TBest. I hope we can continue the scorekeeping as we did last season, where every game gets reviewed or at least a quick look-over. This means a lot of work for the scorekeeper (me). Therefore, you might at some point get a mail from me, asking you to review your game. I'd encourage everyone to do so, as you have given your games way more thought than i did when looking them over. I'd also like to ask everyone to not send me underwear this season. Thank you for having a 12 day window. I will be on a cruise the 2nd-10th so I won't have internet to join during that time. Thanks for scorekeeping again Farah. Enjoyed your services ;] last season and looking forward to it again this CL. Spreadsheet rules list 6 substitutions. Do we have an overview where the Masters roster went? Chickens! I thought i edited the subs limit already. Guess not, but now it should be there! One is out of line. #2 ONE! - They've been solid and growing exponentially in skill and quality for the past 2-3 seasons, it's impressive to see and it's really been a help for them to see their players grow such as 89thlap, malakkan and fivestargeneral and a few others which I haven't mentioned. They aren't weak anywhere, they've finished runners up to the notorious masters. They are expected and they will be fighting for the title this season. Also taking into consideration Pardon from masters has joined them. #3 M'Hunters - Skill wise they've improved, you can tell that the experience of A has made them a more cohesive group as a clan and that's showing in their results. Hobo gone is a loss but Leopard has improved, the emergence of georgie and a more seasoned AI will more than make up for this loss. What's special about M'Hunters is they may not have the most skill on paper but you can tell they want to win every game for every point and that's the dangerous formula that can win any game in this intense competitive league. I wouldn't be surprised if they went all the way to the end. #4 SNinja - Rakleader being the star player, he will carry Sninja to safety. They're limited by their lack of top players but they've almosttricky back and a good few solid players in the form of Max and others. It's impressive to see how the recruiting has turned Sninja from a solid clan to a good clan, hopefully the hard work of the past seasons will reap the rewards for them this season. D-ceo needs to perform, this is the league where you need everyone pulling their weight and not screwing up. #5 Lynx - Imo have the most weakened line-up in the league if you compare to the past season. Many new players who I don't think are A quality like Jo Jo who booted last season in Biomes. Wini had a terrible start in French brawl 0-3.. so it's going to be interesting to see how Lynx do with this new roster, I believe they have the skill to survive in A but I just don't' see them climbing up the league, It will be a season of transition to set up for a race to the title win next season. Kurdistan and Hades are rusty and the Turkish isn't the same Turkish i remember 2-3 seasons ago for Icelandic Turtles, there's a lot of questions that needs answers. Le Marseilles the clan cheerleader needs to put the pom poms down and show what he can add to the squad. #6 Outlaws - Bonsai being on 3 is a big boot risk, he booted 20% of Outlaws games last season, We've lost Odin and Kezzo who carried me in Europe and Szeurope, so we are extremely lacking depth in all departments. Edge has been reducing his game activity and Lucien on a 1v1 is a big maybe, overall this isn't the same Outlaws that want to survive in A like the past two seasons. But however I'm optimistic and think we can fight Lynx in a good relegation fight considering we've beaten them in head-to-head match ups the past two seasons, I think we can make it a close fight. Though in the end, I think it's better for our development to be 6th. My retirement is the final nail in the coffin in this declining trending clan. #7 Statisticians - I don't they even believe they will survive in A, once your defeated in the mental state already, you're not going to survive. I beleive if they play to their absolute potential and give it a good go, I think they can join the three way fight of Outlaws Lynx and stats to really try and survive in A. Math Wolf is an accomplished player and Nauz does have skill if he's focused. Yeon is 100% the most under-rated player in this league, we will see his value in his 1 slot. My personal tournament favourite there.. They need to overperform in 2v2 Cookies for a shot at this survival mission. Since when did retirement consist of playing two team slots in CL? That's like saying I can't give up smoking because I'm still an alcoholic. I have retired too! Can't you see that FSG. And Nice Predictions Plat. Yes, tbest and thanks for running CL while you're at it. Nah, you guys are bad at "retiring". Are plat's predictions going to be as accurate as last season when he was certain that GG would be 2nd or 1st? If SNinja isnt 1st by the end I will be very surprised. Plat is a great leader. Max hasn't watched the stream, because if he did he would know the story with Bohun. Did you hire an English tutor for him? Didn't think so. I teach on weekends, I'm retiring to educate the Omegle dicks one at a time at how to speak English. They need to overperform in 2v2 Cookies for a shot at this survival mission. "Wini had a terrible start in French brawl 0-3.."
Wini started 0-2 and finished 4-2, don't sleep on him.